You will hear many things about today's Pebble acquisition by Fitbit - that it was about software, firmware, engineers, intellectual property, or simply that Pebble was unable to continue on as it existed. The one examination you should take to heart, though, is that Fitbit just straight up wrote a check to kill a competitor. There's really not any other way to slice this deal from Fitbit's end: Pebble was competition, even if not necessarily in a big commercial sense these days, and this was an easy way to smother a company that had hogged much of the wearable limelight. Fitbit even goes so far as to make expressly clear that they are not acquiring any assets or personnel related to Pebble's hardware division - only its software and firmware teams, and some intellectual property. 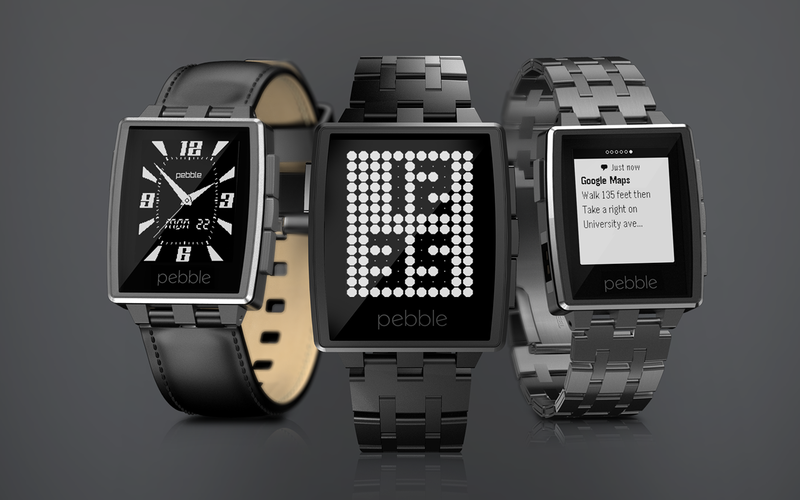 The original Pebble predates Android Wear, and since the first model, the Pebble line has continued to improve and develop. 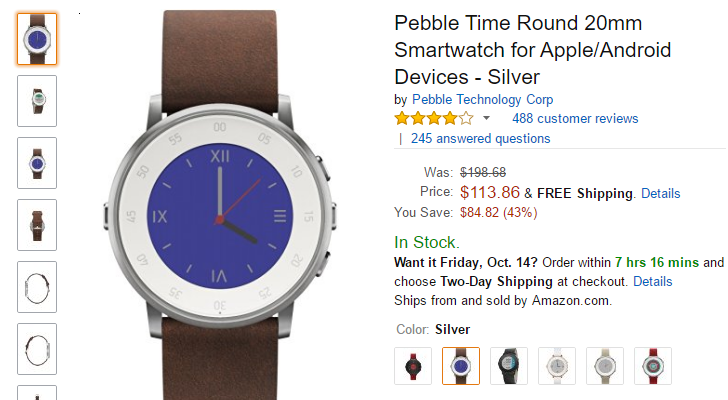 One of their newest watches, the Pebble Time Round, has dropped in price significantly on Amazon. It's now only $113 for the Silver model on Amazon, almost half off from its original price of $199. The Time Round has many of the features of their Pebble Time wearable, with the notable exception of having a circular screen. 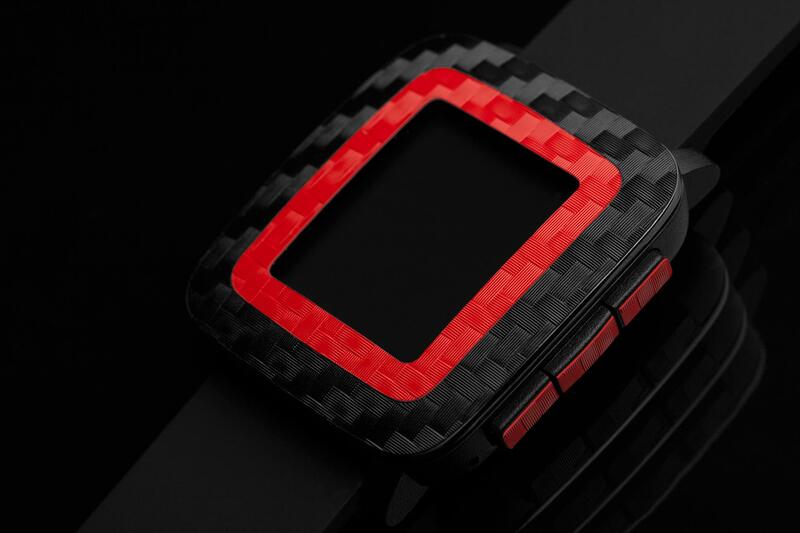 The watch has an always-on color e-paper display, giving it an estimated battery life of two days. It also has a step and sleep tracker, downloadable watchfaces, and of course the massive library of Pebble applications. If Android Wear doesn't meet all your smartwatch needs, the Pebble series of devices is an impressive alternative... and it doesn't hurt that most of the time, it's the cheaper option. That's especially true today: discount online retailer Monoprice has the latest version of the platform, the Pebble Time, on sale. You can pick one up for just $97.99, plus shipping and local sales tax, when you apply the coupon code "AP20" at checkout. That's a discount of over fifty dollars compared to the retail price of the plastic model. 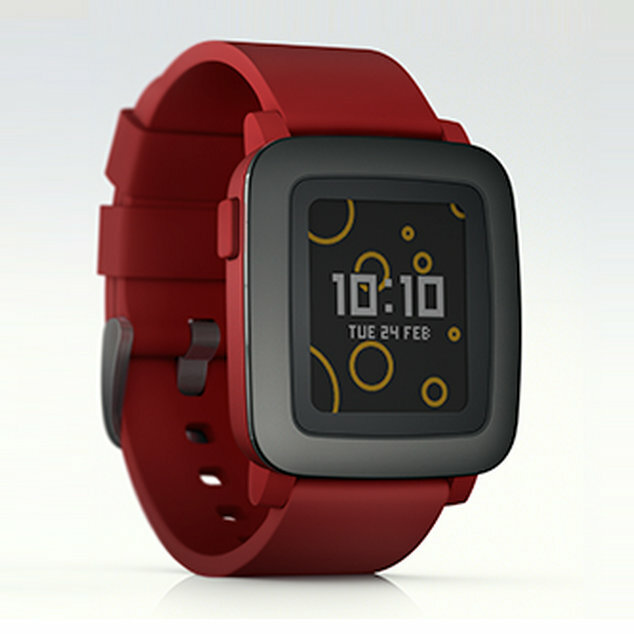 That second campaign gave rise to the Pebble Time, an updated model with an improved, colorful screen and a smarter interface. The watch has an MSRP of $199.99, but the general street price is closer to $150. Still, you might want to turn your eye toward Groupon. 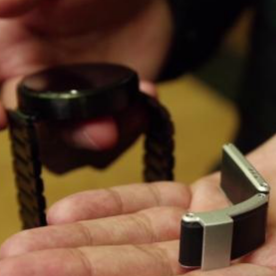 Smartwatches are bulky - there's no getting around that. Even Apple, the very embodiment of tech's obsession with downsizing the z-axis of your products at all costs, can't make a thin smartwatch. Today, Pebble has decided that it can make a thin smartwatch, and that this watch can be round* (*with a massive, enormous bezel) and apparently that most of the company's claim to fame in smartwatches - battery life - really isn't super important after all. 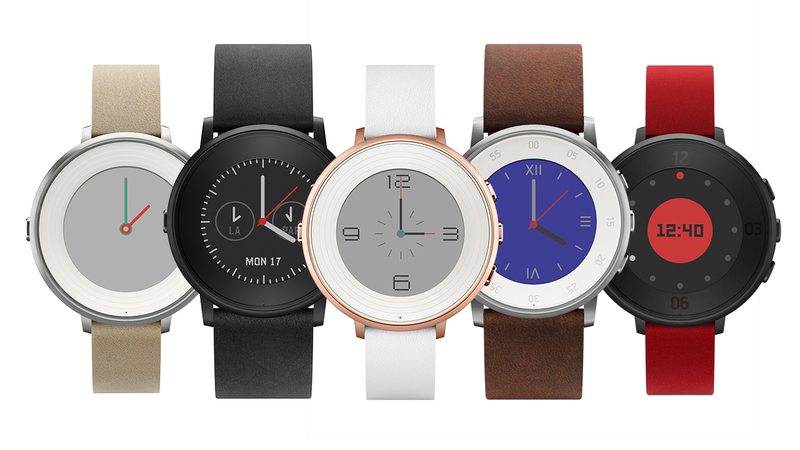 Meet the Pebble Time Round. It's a round Pebble Time that's just 7.5mm thin and, according to Pebble, will last 2 days on a charge. Before there was Android Wear and the Apple Watch, there was Pebble. Honestly, it kind of started the whole smartwatch trend - sure, there were others before it, but Pebble was the first to really gain what could be described as popularity. In fact, it was the only watch dbrand offered skins for at first. At least until now. Pebble's newest watch, Pebble Time, ditches the old-school black and white interface for a more modern, always-on, color display. This basically puts it on the same playing field as Android Wear and the Apple Watch. But you know what it has going for it that the others don't? Here's the problem with Android Wear. Although my G Watch R is always with me, notifying me and taking my commands, controlling it with anything but voice seems a tad cumbersome. You can realistically hold and interact with a phone using one hand, but you can't with a watch. You need both hands, which, if you ask me, feels like a step backwards sometimes. If my right hand is in my pocket, or holding something, steering, mixing a batch of cake filling, typing, grocery shopping, brushing my teeth, climbing a mountain, squeezing a lemon, or otherwise occupied, I have to interrupt whatever it is doing and bring it together with my left wrist to take care of a new notification on my watch. The Pebble Time still has almost a month to get more pre-orders on Kickstarter, but it's already passed the $10 million mark, which is the record set by the first Pebble. In preparation for what is sure to be a big launch for the company, the new v3.0 update of Pebble's SDK is now available. Developers can start building apps for the Time, and they'll work with the regular Pebbles in the meantime. 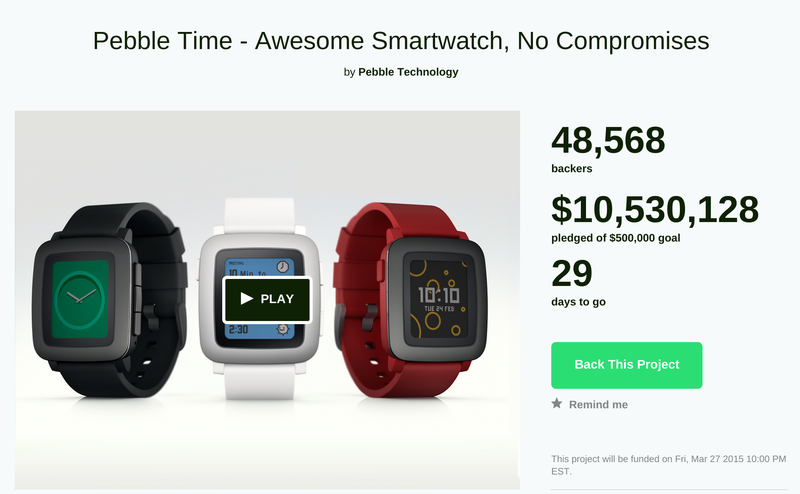 Pebble played it smart with this campaign. Without having to part with a single device, the company has already attracted millions in funding and stirred up plenty of anticipation. Nearly 50,000 people have thrown money at the project thus far.